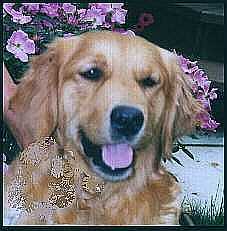 This is another Rebelcreek Golden Retriever -- Brea (Rebelcreek's Wild Angel), born December 18, 1995. Brea lives with good friends of ours who have two other golden retrievers from Rebelcreek. 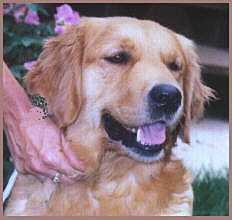 She is loved and fawned over by her family and will, in February 1999 be coming to Rebelcreek to have a litter of beautiful golden retriever puppies. Brea is a gentle and loving golden retriever who finds the world a wonderful place. At 22-1/2 inches and weighing 68 pounds, Brea is a sturdy and pretty golden retriever with lovely medium gold coat and very nice light gold feathering. Brea has a very pretty head, very correct shoulders and rear and is very sound structurally. She fits beautifully into the Golden Retriever breed standard. Please excuse the smudge on the lower left of this picture. As you can see Brea is a smiling, happy golden retriever. A lover of being patted, Brea knows how to squirm her way in children's hearts and will stay for hours for grooming and patting. She exhibits excellent golden retriever temperament. Her foster family takes extremely good care of her and she and her two golden retriever "brothers" live a life of bliss. Brea is a daughter of one of our retired golden retrievers, Annie and we look forward to her puppies. Her foster dad says he will take the night shift when the pups are being born ... we'll keep you posted !!! Brea is a wonderful golden retriever experience !! !